Summary: A little tiresome perhaps but there are enough twists and comic turns to keep us interested. There was a time when the Summer box office was routinely dominated by runaway pirate adventure pictures. From the twenties until the late fifties the genre seemed to have a particularly ubiquitous pull on audiences. In its favour it had a heady mix of straightforward storytelling, action and a hint of fantasy, and rarely had the same moralising tendency found in the Western. While our affection for swashbucklers may have dwindled however, it seems Hollywood producers, and indeed stars, still have a curious fondness for tales of adventure on the high seas. The roll call of icons from the genre’s heyday has been added to in recent times, mostly with cause for regret, by, amongst others, Kevin Klein (Pirates of Penzance, 1983), and Robin Williams and Dustin Hoffman (Hook, 1993). Even Roman Polanski was unable to resist, directing Walter Mathau in the frankly weird Pirates (1986). Enter Johnny Depp, the latest rogue to drop his anchor in waters still ruled by Douglas Fairbanks and Errol Flynn. From the moment he steps off his sinking boat onto the harbour at the British-owned Port Royal, it’s clear that we’re embarking on a mission to lift the curse on this tarnished genre. And guess what matey, Robert Louis Stevenson will be smiling in his grave, because this is a stirring tale, lovingly embellished and, no matter how cynically conceived, excellently executed. Pirates of the Carribean delves the depth of Davey Jones’ Locker in salty sea dog clichés – but then it’s those that make the genre such marvellous fun. Director Gore Verbinski and the writers Ted Elliot and Terry Rossio (Shrek) chart the territory with aplomb. True to form Verbinski (“The Mexican”, “Ring”) tempers the cartoon elements that one rightly expects from a Disney production, with enough grotesque humour and indeed genuinely chilling moments to ensure the kids will remain silently rapt for the film’s astonishingly lengthy 140 minutes. Depp plays Captain Jack Sparrow a rum-wracked Cockney con artist whose hapless appearance prompts his antagonist Commodore Norrington (Jack Davenport) to tag him “the worst pirate ever.” We learn that he has lost his ship, the Black Pearl, and a considerable trove of Aztec gold, in a mutiny led by Barbossa (an impeccably evil Geoffrey Rush). 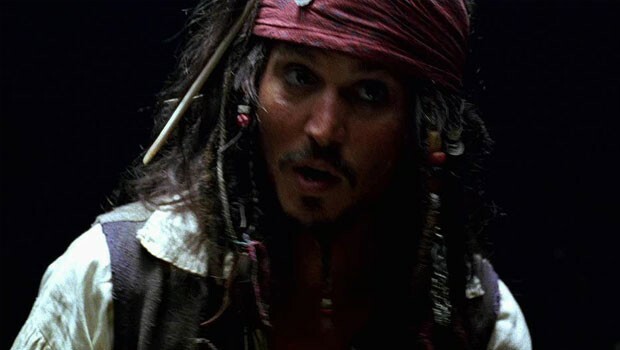 Having escaped to Port Royal he avoids execution for being a pirate when Barbossa’s men plunder the town, kidnapping the royal governor’s daughter Elizabeth (Keira Knightley, Bend It Like Beckham). Jack outwits Elizabeth’s suitor, the Pirate-hating Commodore, and joins forces with Will (Orlando Bloom), a lowly blacksmith whose love Elizabeth secretly yearns for. The pair hijack a British ship and set off in pursuit of Barbossa and Elizabeth. Barbossa needs to go to the Isla de Muerta to return a piece of gold (which has ended up in Elizabeth’s possession via Will, whose father, it transpires, was a Pirate) in order to appease the heathen Gods and lift the curse under which he and his men toil. The film’s highly visceral special effects ensure us of a ghastly surprise when the symptoms of the curse are revealed: By moonlight the Pirates turn into living skeletons. Furthermore, as first Jack and Will, and then the Royal Navy catch up with Barbossa, there’s fight scene after fight scene with the by-now familiar “we can kill you, but you can’t kill us” conceit. A little tiresome perhaps but there are enough twists and comic turns to keep us interested. Bloom and Knightley, whose characters declare their love in the end, are a little bland in the straight romantic roles, although it’s hard to be much more than a sideshow with Depp and the rest of the gallery of thieves in such crackling form. Depp excels in one of his most charismatic roles. Rumour has it he based the character on Keith Richards. I’m sure Flynn, the original Hollywood bad boy, would approve.